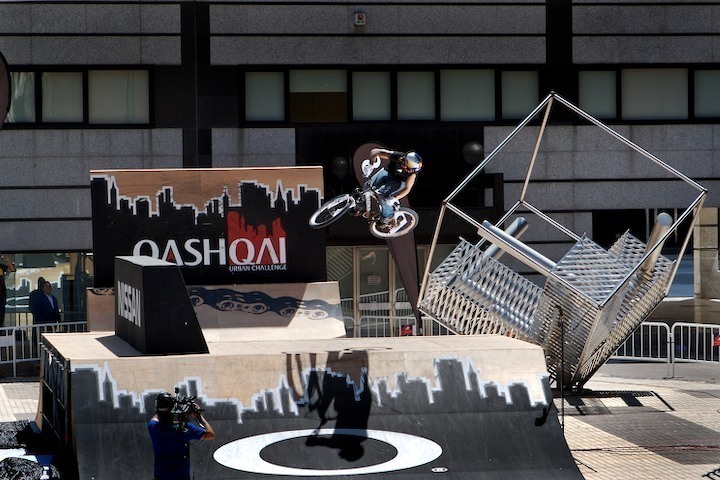 The final runs of the top twelve riders at the Madrid stop of the Qashqai Urban Challenge were absolutely off the charts. Riders were tricking lines that had previously not been attempted, and at the end of the day, Paul Basagoitia came out on top. Day two of the Street stop of the Qashqai tour brought out some new, creative lines from riders like Darren Prokoj, Chris Akrigg and Darren Berrecloth. The day started out with the second round of qualifying, where Darren Pokoj (who qualified fourteenth after the first round) found a new line through the stair section of the course, 270-ing off of the first cement block, hitting the wallride, then doing a bunnyhop 180, sliding his front tire around on the wedge landing to complete the 360-degree rotation. Pokoj flipped the step-up and ended his run with a 360-nosedive on the last jump. Chris Akrigg also came through with an original run with creative lines. He used his surroundings by bunnyhop-gapping to a railing above the stair section, then jumped from the rail into the wallride. Immediately after, he stuck a 360 tailtap on top of the cement pipe spine obstacle. The crowd was totally blown away by the lines that Akrigg opened up in his second qualifying run. At the end of the second qualifying run, most of the top riders chose not to ride, feeling confident that they would still have a spot in the finals. The other riders were not able to unseat Darren Berrecloth, Paul Basagoitia and Adam Hauck from the top three positions. The riders took a break from the action to eat lunch and have a short siesta, then it was time for the finals of the Madrid contest. The final runs continued to push the riders to do even more difficult lines. Each rider was trying to one-up the rider before him, doing more variations on similar lines or trying completely new lines. Chris Akrigg continued to open up more creativity on the course with an attempt to gap from the cement block at the top of the stair section, to the wallride that was easily twenty feet away! No one could believe their eyes when he launched such a ridiculous gap. Akrigg made the distance, but wasn’t able to stick to the wallride, and he crashed into the steps below. Paul Basagoitia sat at the top of the start ramp, hungry to retain his overall lead in the Qashqai Urban Challenge series. Paul chose the left-side line, which contained two small jumps into staircase landings. Paul 360’d the first jump and tailwhipped the second jump. Paul followed these two jumps with a no-foot can over the box, walltap on the wallride into a stretched out superman on the box jump. He continued his assault on the course with a no-foot can transfer from the concrete block at the top of the stairs down to another staircase landing. Paul ended his run with a flip up the step-up, 360 on the step-down and a backflip table on the last jump. Riders continued to step-up the level of riding through the rest of the first round of finals. Even though Paul Basagoitia’s first run was amazing, he felt the need to continue riding hard. In his second run, he attempted to tailwhip the stair section gap! The bike made it around, but Paul did not land perfectly into the staircase and crashed on the concrete. When the top riders are throwing tricks as crazy as this, it’s obvious that the level of competition is running high! Darren Berrecloth was the last rider to go in the second round of the finals, and he knew that it would take some serious bangers to challenge Paul for the top spot. Bearclaw rolled down the start ramp, aiming at the left side (staircase jumps) and suddenly 360-transferred over to the landing ramp that was on the other side of the staircases! The crowd was going crazy for Bearclaw’s final run as he 360ed the drop and superman indian-aired the box jump. Bearclaw also launched on the back side of the box jump and did a tuck no-hander to flat, street style. He continued his run with a no-foot can on the stair section gap, 360’ed up the step-up and floated a huge 360 table on the last jump, much to the enjoyment of the thousands of people gathered in the area of the final obstacle. Judges and riders alike deliberated about who would take the top spot, but at the end of the day, Paul Basagoitia would end up in first place. Berrecloth was in second, followed by Darren Pokoj in third. The riders doused Paul Bas with Red Bull on his way to the podium, and Paul wasted no time spraying the trophy girls with champagne. The podium was situated on a platform above a pool, so after Paul accepted his trophy, he proceeded to dunk one of the trophy girls in the pool—much to the enjoyment of the crowd and the rest of the riders! Paul’s first place finish gave him enough points to continue leading the Qashqai series, but Darren Berrecloth is still within striking distance for the overall win. Next week will be the Park event in Cologne, which could mix up the results quite a bit, since most of the riders on the tour are dirt specialists. 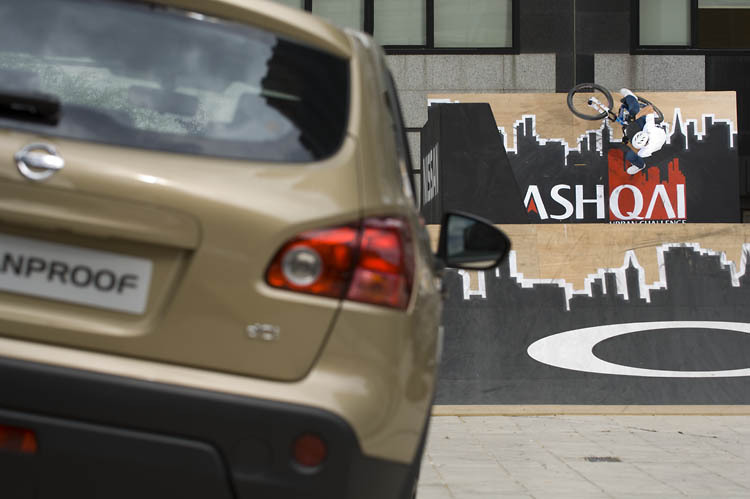 Visit the Qashqai Urban Challenge website (www.nissan-qashqaichallenge.com ) with information about each city, the events, rider bios about the invited tour riders, results and rankings. Videos of the action can also been viewed on Freecaster.tv from the Newcastle and Milan stops of the Qashqai Urban Challenge. To check out the action directly, go to: freecaster.com. 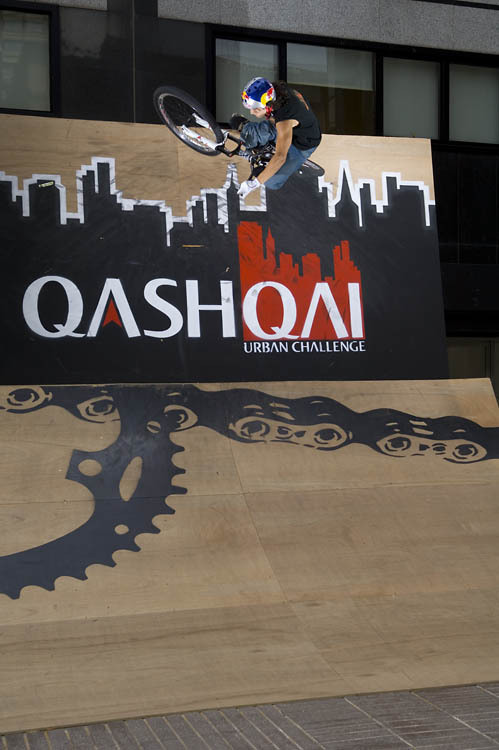 Next week, on May 25/26th, the Qashqai Urban Challenge will stop in Cologne (Germany) where the riders will take on the city and ride the Park event!